There has been plenty of ink spilled on the news surrounding Bill Holland - the Illinois Auditor General - releasing a report on a crazy amount of waste involved in an sham anti-violence program that Governor Pat Quinn rolled out on the South Side of Chicago right ahead of his 2010 election campaign. Some are calling it a 'slush fund' that helped Quinn win some critical support. It tells us a slightly different story. And speaks to the real power of an Auditor. When they're actually doing their job and not being totally absent from their job while they campaign for political office. A state audit released today criticizes the spending and management practices of a $55 million, taxpayer-funded anti-violence program for Chicago and Cook County that Democratic Gov. Pat Quinn launched in 2010 as he was engaged in a tough election campaign. The report by Auditor General William Holland said the program was "hastily implemented," failed to target some of the highest crime neighborhoods in Chicago and relied on recommendations from Chicago aldermen and community organizers rather than a more objective process to select which community organizations should get funding. Shame not all Auditors can be as effective, right? 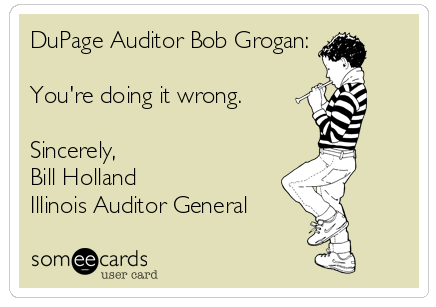 Seems that we've covered DuPage County Auditor Bob Grogan and his poor performance before. You can see the story here about how not only did Grogan blow his budget up (hello Big Government!) he also conducted just three tiny audits in one year (while the guy in Will County did 57. Yes! 3 vs. 57 during the same timeframe!). We intercepted a note that Bill Holland - the Auditor General - sent to Bob Grogan. We have to agree with Mr. Holland. And at the same time, feel bad for taxpayers in DuPage County.